(Natural News) Anti-cancer research regularly turns to nature for potential cures and more often than not, nature doesn’t disappoint. Such is the case with the Japanese persimmon, which research published in the journal BMC Complementary and Alternative Medicine revealed to have great potential as a treatment for colorectal cancer. Among cancers, colorectal cancer is among the easiest to detect and is one of the most treatable. However, it is also the second most deadly, ranking just behind lung cancer. Considering the horrific side effects of chemotherapy (hair loss, fatigue, susceptibility to illness, organ damage, and death, to name just a few) it’s not surprising that a good number of cancer patients are now turning to plants and other natural sources of potent nutrients to cure their condition. The Japanese persimmon (Diospyros kaki Thunb) one such plant. In traditional Korean medicine, it is used to treat hiccups, asthma, and cough, as well as relieve chronic bronchitis. Studies on its pharmacological properties revealed that it has anti-inflammatory properties. The researchers wanted to know if the persimmon’s healing benefits also made it effective against colorectal cancer. For their study, they administered 70 percent ethanol extracts from the persimmon’s calyx (DKC-E70) to human colorectal cancer lines that included HCT116, SW480, LoVo, and HT-29. They ascertained cell growth through an MTT assay system. To determine the effect of DKC-E70 on the expression of cyclin D1, an important regulator of cell growth that also plays a vital role in tumor development when overexpressed, they used a Western blot and an RT-PCR. They found that the ethanol extract successfully suppressed the proliferation of the cancer cells by inhibiting the expression of cyclin D1. This, they believed, made DKC-E70 a potentially effective therapeutic agent against colorectal cancer. It improves digestion – The persimmon’s high fiber content boosts the body’s ability to process food and eliminate waste products. In this manner, it helps keep the colon clean, functional, and at a lower risk of developing nasty conditions like colorectal cancer. It improves immunity – It is packed with antioxidants that improve the body’s protection against free radicals. These antioxidants are instrumental in preventing the onset of several types of cancer. It lowers blood pressure – It contains potassium, a nutrient that aids in controlling blood pressure. Because of this, persimmons can help curb one’s risk of developing cardiovascular diseases, as well as complications from hypertension. It improves metabolism – Persimmons contain B-vitamins, such as folic acid and thiamin, that aid in metabolizing the nutrients one eats. B-vitamins are especially important in converting carbohydrates into energy, ensuring that the body receives the fuel it needs for proper function. B-vitamins also help improve one’s energy levels and muscle tone. It improves vision – The fruits contain an abundance of zeaxanthin, a plant pigment that is also found in large quantities in the retina. This chemical has antioxidant properties that prevent premature damage to the eyes and delays the onset of macular degeneration and even cataracts. 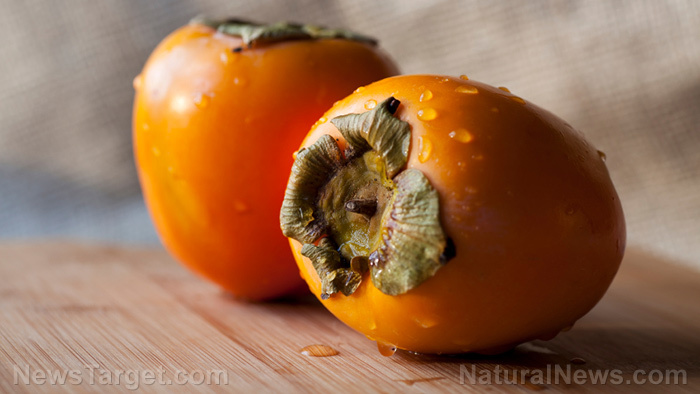 Learn more about the health benefits of persimmons at Remedies.news.